Glad I didn't have to pack it out! I grew up learning to fish with my grandfather in the Sea of Cortez, Baja California, Mexico, but we didn't have any hunters in my family, nor gun enthusiasts. So I never got to hunt. I moved from California to Colorado a couple years ago and wanted to get into hunting. I quickly learned that many hunters are not willing to share information about hunting, especially where to hunt. I even helped a friend of a friend by hiking up 2000 vertical feet in 3 miles at night following terrain features to pack out both bone-in hind quarters from his cow elk, and got some meat, but no hunting advice. 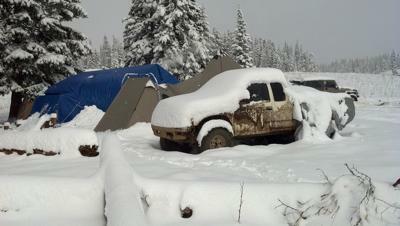 Since then I have been on two public land hunts with my neighbor and his friends, camped out at 11,000 elevation. The first year we got snowed out on the second afternoon. I was the only smart one and left camp. The rest were stranded for five days before they ran out of booze and pleaded for us to blaze a trail up to them to get them out. This year I had a public land mule deer buck tag, and two private land cow elk tags. Of course, I saw five cow elk go past me at 25 yards past my rifle's zero during my public land hunt, but no muleys! I was thinking, I better see elk on my private land hunt! We didn't get much snow this fall, so the elk were not driven down in elevation for quite awhile. Toward the end of the private land season I was checking for elk each day on the property and other properties nearby, not seeing any elk. I was scheduled to be out of town the last three days of the season and hadn't seen anything so I was getting pretty bummed. On the last day I would have a chance. I was bummed when I got to the property and no elk nor any hoof prints in the snow. I stayed the day on the property and in the afternoon I just happened to walk outside to see about thirty elk on the side of a hill not fifty yards away! My adrenaline went through the roof! I went back inside, got my blaze orange on, grabbed my rifle, loaded it, and put some hearing protection in. them. I walked out in their view then ducked behind the building to get on the other side of a green metal ranch fence. I walked along the fence out into view of the elk, crouched down and laid my still stowed bi-pod on a rung. I took the safety off, looked for a nice elk standing broadside, roughly setup to aim at it, then considered what I was about to do. I had two private land cow tags and I had never taken a big game animal before. I knew my rifle sometimes has issues grabbing a round when I cycle the bolt, so I planned to take my time & make sure it grabbed a round the first try after taking the first shot. 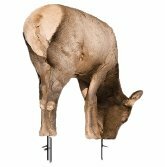 I took a few deep breaths to calm down then aimed at the cow standing broadside and boom! I cycled the bolt while the herd turned around, ran 50 feet, then stopped. I looked up ready to shoot again then saw my elk's legs buckle and it went down. That spooked the herd again and they started to move. Fortunately about four or five elk didn't turn around with the herd and they were still standing there looking at me. I took aim on one standing broadside and boom! Cycled the bolt again & watched it stagger and then roll about 20 feet down the hill. It all happened so fast and I had two cows on the ground and a lot of work ahead of me. I was by myself and my friends were all at work. I pulled each of the elk into shade then started gutting one of them before a friend showed up. We worked on them for about six hours while the temperature dropped to minus 5 degrees! 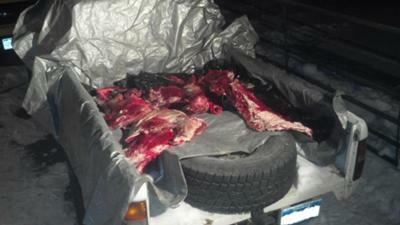 I put a tarp in the back of my truck and laid all the meat on trash bags & wrapped it up. I wanted to try and figure a way to set something up so I could hang the meat to age it, but decided to take it to a highly recommended meat processor instead. It turns out the place I took it cuts a lot of steaks for high end restaurants, so all my ground meat has 20% fat from ribeyes and such ground into it! I told them I was not in a hurry and to let it hang for as long as possible. The meat is amazing! 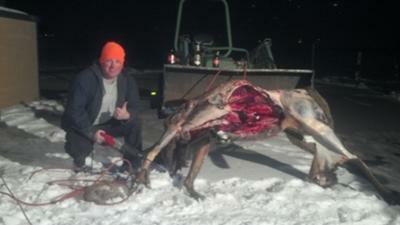 Comments for Finally filled the freezer..
What a great story on hunting and filling up the freezer. I always seem to have a freezer that is not quite big enough. 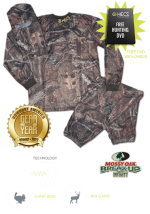 I hunt many places, one is called www.peartreegameranch.com for deer. I hope to over fill the freezer again, this year. Well, that's a great way to start out your hunting "career"! Thanks for posting the story. Sounds like you'll need some help eating all that meat. When's the backyard BBQ party scheduled? Grab the biggest loin roast and give this procedure a try: Spice-Crusted Grilled Elk Roast. Good shooting! Dropping a second elk from a herd takes focus. Join in and write your own page! It's easy to do. How? 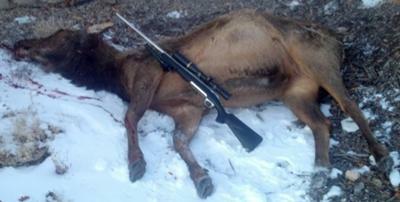 Simply click here to return to Elk Hunting Success 2011.